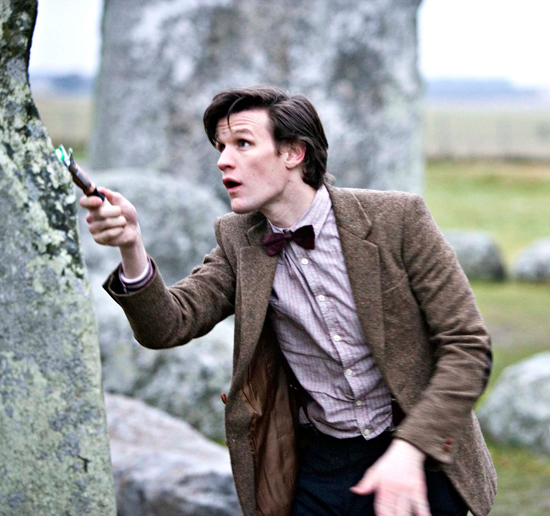 “The Pandorica Opens” was the…er, opening salvo in the two-part finale of DOCTOR WHO, marking the culmination of Matt Smith’s first season as the Doctor, and the story served as a brassy, boastful shot-across-the-bow to viewers, warning them that this story was going to pull out all the stops. The story began in 1890 France, where a screaming-mad Vincent van Gogh (Tony Curran) had completed his strangest painting yet. The unseen work came into the possession of Prof. Bracewell (“Victory of the Daleks”) in 1941, who showed it to Winston Churchill, who recognized it as a warning for the Doctor and tried to phone him. The call was diverted by the TARDIS to the Stormcage Containment Facility in 5145 (some time before the events of “The Time of Angels”/“Flesh and Stone”), where River Song (Alex Kingston) got the message. She promptly escaped (employing a great gag with hallucinogenic lipstick) and retrieved the painting from the Royal Collection of Liz Ten (“The Beast Below”). Securing “a vortex manipulator, fresh off the wrist of a handsome time agent,” Song left another one of her “Hello, Sweetie” messages for the Doctor – this one defacing a diamond cliff face on Planet One, the oldest planet in the universe. The message sent the Time Lord to Britain in the year AD 102, where Song was masquerading as Cleopatra near Stonehenge. (BTW, the Doctor maintained that the message had never been translated before; I cannot believe no other Time Lord ever used his TARDIS to decipher the code! I suppose River did her graffiti in the post-Time War era, so the Time Lords must have been out of the picture?) 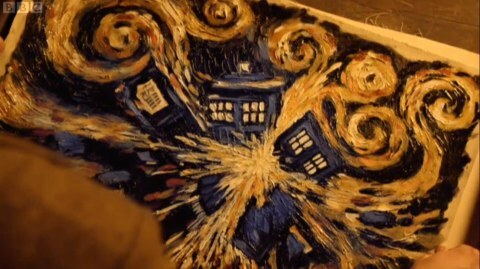 The painting depicted the TARDIS exploding (it was rather beautiful, wasn’t it? ), and was titled, “The Pandorica Opens.” River claimed the Pandorica was “a box, a cage, a prison; it was built to contain the most feared thing in all the universe.” So who exactly was locked inside? I began to figure it out as the episode unfolded: the description of the Pandorica’s prisoner as “a goblin or a trickster or a warrior – a nameless terrible thing,” could very well apply to the Doctor. As for the “soaked in the blood of a billion galaxies” part, well, that just depends on your perspective; we know the Doctor is capable of genocide. And he certainly would qualify as “the most feared being in all the cosmos” among any number of cultures. And, while so many races were familiar with the Pandorica, why did the Doctor know nothing about it? And did he actually appear… intimidated for a moment? The Doctor claimed that a “good wizard” tricked the Trickster, prompting River to quip, “I hate good wizards in fairy tales – they always turn out to be him!” And, in a way, the same held true here: There was a good wizard, and there was bamboozling going on. And what came back? (Well, besides the Doctor’s past, that is…) Rory. 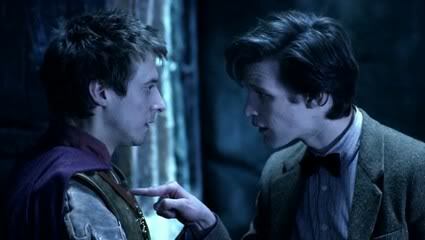 Somehow, Amy’s fiancée, Rory Williams (Arthur Darvill), who was killed in the waning seconds of “Cold Blood,” found himself occupying the body of a Roman legionnaire. “Well, I died and turned into a Roman. It’s very distracting,” he confessed. Okay, it wasn’t really a Roman legionnaire, but rather an Auton. But that just made his “resurrection” all the more confusing. Was Rory’s “soul” somehow captured by the plastic body? Is this another Pinocchio situation, like that cringe-inducing sequence from “Victory of the Daleks” in which the Doctor and Amy convinced Bracewell that he was too…er, human, to explode like the Dalek bomb he actually was. I think viewers were supposed to believe Bracewell became a real boy at that point, so maybe that’s what’s happening to Rory. But what, exactly, was happening at Stonehenge, with between 10,000 and 1 million alien vessels orbiting overhead? Sure, the Pandorica was opening, but why was a Roman legion present? “Does it ever bother you, Amy, that your life doesn’t make sense?” the Doctor asked. Turned out there was a reason for all the extra doors and coincidental appearances of Amy’s favorite childhood themes. River finally figured it out: the scenario was a trap engineered by the Doctor’s enemies using Amy’s mind to create circumstances that would lure him to Stonehenge. Apparently the power of love enabled Amy to remember Rory just as he began fighting being activated as an Auton agent. Poor Amy! Karen Gillan had a couple of nicely powerful yet subtle moments. I am convinced that Amy already belongs in the pantheon of Great Companions. The Pandorica Alliance, however, decided that the Doctor belonged locked in Pandorica’s box, because they believed his actions would cause the destruction of the universe when his TARDIS explodes. Strangely, their entire rationale seemed to be based on a misapprehension that “only the Doctor can pilot the TARDIS.” This is patently not true, and could turn out to be a fatal mistake – for the entire universe! This entry was posted in Cult TV, TV and tagged 11th Doctor, Amy Pond, Doctor Who, Karen Gillan, Matt Smith, Pandorica Opens, River Song, Rory Williams. Bookmark the permalink. Can’t wait to hear what you have to say about Big Bang!